Curious about what makes Pure Clean the best in the business? Here are the answers to some of our frequently asked questions and information on our carpet cleaning services. If you have any questions that you don’t see an answer to here, give us a call. We’re always happy to talk to our clients! Pure Cleans pricing is determined by a thorough evaluation of the carpet. Unlike other companies, we are trained and certified in over 7 methods of cleaning and will align the proper process & system with the type of carpeting and soil conditions that are present. Our standard 12-step carpet cleaning process starts at .50 cents a square foot. This cleaning is NOT like anything you’ve experienced, so if you are comparing just realize that our cleaning is on a different level than other companies – trust us. Hard surface cleaning is priced by the square foot and varies depending on the type of flooring we are cleaning. Commercial work is also charged by the square foot and takes into account the level of soiling in the carpet. Stains & odors require on-site inspection to determine time and procedures for improvement. Oriental rugs are priced by the square foot and are $3-6 per square foot based on different variables. You are able to pay online or on the phone. We accept all credit cards, including Visa, Mastercard, and Discover cards. You may also pay by cash or check the day of service, or send a payment via mail. Please do not send cash payments by mail. Call our office to discuss our billing or pay your bill. Do You Guarantee Stain/Odor Removal? Our standard 12-step carpet cleaning process is $60 dollars per room (up to 150sf). This cleaning is NOT like anything you’ve experienced so if you are comparing just realize that our cleaning is on a different level than other companies – trust us. Hard surface cleaning is priced by the square foot and varies depending on the type of flooring we are cleaning. Commercial work is also charged by the square foot and takes into account the level of soiling in the carpet. Stains & odors require on-site inspection to determine time and procedures for improvement. Oriental rugs are priced by the square foot and are $3-6 per square foot based on different variables. To learn more about our pricing, give us a call and we’ll happily help you find a package that fits your budget. At Pure Clean, we do things differently. We do things better. We only use 100% all-natural cleaning products that are powerful enough to lift tough stains and remove odors, yet so harmless that they are safe to drink. We use high-powered cleaning systems that heat our deionized water to 220 degrees F so that your carpets are not only clean, but sanitized as well. Then, using our powerful truck mounted systems, we suction the water from your carpet, leaving them dry in 1-3 hours. Other Seattle carpet cleaning companies use harsh, harmful chemical based cleaners that leave sticky residue on your carpet which actually makes your carpet wear out more quickly, and gather more dirt. They leave so much water in your carpets that it can take more than 10-24 hours to dry. There are big differences between other Seattle cleaners and Pure Clean. Curious to learn more? Give us a call. We don’t match competitor prices because we don’t offer our competitors traditional, ineffective, chemical-based services. Instead of being like all the other carpet cleaning companies in Seattle, we decided to do things better and cleaner. This is why we created our customized ‘Big Truck’ with high-powered cleaning systems that produces deionized water so hot it sanitizes your carpet as it lifts away all dirt, grime, and bacteria. It even washes away chemicals and residues left by previous traditional carpet cleaners. Pure Cleans pricing is determined by a thorough evaluation of the carpet. Unlike other companies, we are trained and certified in over 7 methods of cleaning and will align the proper process & system with the type of carpeting and soil conditions that are present. This cleaning is NOT like anything you’ve experienced before. Learn why we are different from our competitors and decide to go with quality instead of cheap — give us a call. Pure Clean stands behind all of our work. All our cleaning services come with a 30-Day guarantee, giving you time to report any deficiencies or dissatisfactions to our customer support team. If it is a cleaning concern, the area(s) will be re-cleaned at no charge until satisfaction has been met. If there are items that we simply cannot improve upon, or items that we communicated expectations on before cleaning, these will not fall under our guarantee. What Is Your Cleaning Product? Pure Clean only uses professional products that are certified by the CRI (Carpet & Rug Institute) the Green Seal GS-37, & Indoor Air Quality Association. Our products are aggressive enough to deodorize, sanitize, and clean in one natural process, removing even the toughest stains and spots. But for all their effectiveness, they are also so harmless that they are safe to drink. Our products are also designed to denature dust mite allergens and are a perfect solution for those that are chemically sensitive, have environmental allergies, or other health conditions. If you are concerned about chemicals and harmful substances coming into your home, we are the Seattle carpet cleaning for you. Give us a call or fill out our contact form now. At Pure Clean, we know that waiting for your carpets to dry is a huge pain, especially for busy families with children. This is why we specially designed our carpet cleaning equipment to suction more water from the carpet. Our average carpeting cleaning service will require 1-3 hours of dry time. Our competitors will require anywhere between 10-24 hours or more! This long dry time increases chances of water staining, odors, and mildew growth. If you have thick carpets, however, our dry time may be longer. Carpets such as berber or thick weave carpets require additional drying time due to the thick design and weave of the textile. However, by using Pure Cleans Turbo-Dry process, we can usually have your carpets in “ready-to-use” condition before we leave your home. Applying PureGuard will also increase dry times. If you don’t want to wait forever for your carpets to dry after a cleaning, contact us to schedule an appointment or gather more information. All that needs to be done to prepare for your carpet cleaning is to do a light pre-vacuum and move any breakables out of the cleaning areas. We will move and replace most common, movable household furniture on your behalf. According to our business insurance, our technicians cannot safely move pianos, TVs, computers, china cabinets, and other large or fragile items, so please arrange for these items to be moved ahead of time. Carpet Manufacturers and indoor air quality specialists recommend getting a professional cleaning at least every 6-12 months. Your carpets, upholstery, and mattresses act as air filters in your home and trap contaminants. These build up and cause greater wear and tear to the fibers and fabrics. If you are waiting for your carpets to look soiled before cleaning, then you are waiting too long. Schedule your cleaning on a regular cycle to ensure a clean in-home air environment, a longer lifespan for your carpeting, mattresses, and upholstery, and a healthier home overall for your family. Yes, we certainly can. Whether you are a property manager in need professional cleaning for your entire apartment complex or a renter that would like to keep their apartment healthy and looking beautiful, we are happy to help. We use the same all natural products that we do for a full home cleaning, but utilize slightly different cleaning equipment and technology to allow for a thorough and safe cleaning — no matter what the location. Call our office to talk about cleaning your apartment. What Is Hard Surface Cleaning? At Pure Clean, we offer many more services than just carpet cleaning. We are also professional hard surface cleaners as well. This includes glass, tile and grout, counter tops, and more. Many people neglect having their glass or tile and grout professionally cleaned, but just like any other porous surface, it will become soiled and trap bacteria, oils, and soap residues. This leaves your hard surfaces unsightly, and even slimy. Our hard surface cleaning tools use a combination of cleaning solutions and water under extremely high pressure to remove this soil and dirt. Simultaneously, a strategically placed vacuum port picks up all the soils and bacteria that is rinsed away, carrying it safely to our holding tanks. We can clean tile & grout, balconies, pool decks, concrete kitchen tiles, bath & shower, marble & granite, driveways, and tennis courts. If you’d like to learn more about our Seattle hard surface cleaning services, call us or fill out our contact form. What Is A Specialty Clean? Specialty cleaning is required when we are asked to deal with major or excessive stains such as urine, wine, vomit, feces, water, etc. Because specialty cleaning requires extended time, effort, as well as specialized topical treatments, the hourly rate for Specialty Cleaning supersedes the regular rate per area or rate per square foot for the entire invoice. During a specialty clean we will use a tool called a “water claw” that is designed to remove contaminants from the carpet, the underlay, and even the sub-floor. An ultra-violet light and special glasses are used to help identify urine affected areas. If you have more questions about our specialty clean services, call us or fill out our contact form and we’ll provide you with a quote and details about your problem areas. We clean carpets, upholstery, mattresses, rug cleaning, hard surfaces (tile & grout, concrete), vehicles (autos, boats, R.V.s), hardwood floor refinishing & countertops. We also offer odor removal , marble polishing, shower glass restoration, natural stone cleaning and polishing, pressure washing and much more! If you need something professionally cleaned, we are the guys to turn to. You can learn more about our services here. We can often accommodate same day appointments, but it is always best to call at least one week in advance to assure the time slot you desire. Give us a call or fill out our contact form to inquire about our current schedule. Can You Clean My Area Rugs? What If They Are Silk Or Wool? PureClean specializes in cleaning rugs from all over the world. Our rug cleaning facility is located in Woodinville. We specialize in removing pet odors from rugs as well as removing spots, spills and stains gently and safely. We clean wool, silk, rayon, jute, and many more types of rugs. Give us a call or fill out our contact form to learn more. How Do You Clean Without Using Soap, Detergent, or Chemicals? PureClean has specialty equipment designed specifically to meet our needs and high standards. We use a variety of methods, but our best and truest clean always comes from our exclusive DI (deionized) water that is heated up to 240’F. This water is ‘sticky’ water — because it is 100% clean, it picks up all the dirt, grime, oils, and residue in your carpet and rinses it away. This process leaves your carpets clean, healthy, and completely naturally clean! What Makes The Big Truck Better Than Standard Vans? Our BIG TRUCKS & Our Standard Vans are powered by 350 HP engines and are equipped with much larger vacuum systems than any of the systems used by our competitors. This allows us to produce more heat and much more suction than other carpet cleaning companies. The more suction, the more dirt is removed. The more heat, the more bacteria & germ-killing happens. We currently service most of Snohomish & King county. That includes Seattle, Bellevue, Kirkland, Tacoma, Renton, Redmond, Kirkland, North Seattle, Edmonds, Everett, Marysville, Snohomish, and more. Give us a call or fill out our contact form to discuss our service region with our team. You can call our customer care team at 866-387-PURE or 206-258-7500. Or, simply fill out our contact form. We look forward to speaking with you! What Is My Cleaning Going To Cost? Our minimum charge for carpet cleaning is currently $199.00. To get an exact quote you may contact our customer care team to discuss your needs in further detail and set up a in-home inspection. And, don’t forget, we love to offer deals and discounts! Listen for our radio ads or download one of our free eBooks to get an exclusive discount code. 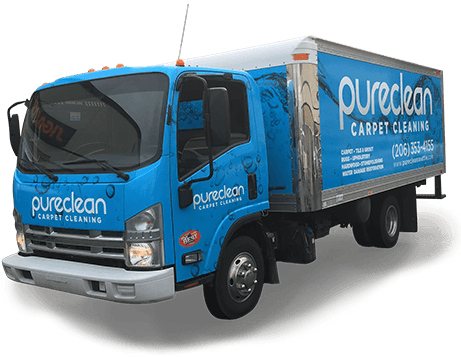 Pure Clean has an exclusive edge cleaning tool that is guaranteed to significantly reduce or completely remove the black filtration lines that most home have around the edges of their carpeted rooms. These lines can be caused by water damage, previous failed cleanings, or the accumulation of dirt in an area that a vacuum is unable to pick up. Gift certificates are available for all of our cleaning services (minimum purchase required). Gift certificates are perfect for a newly married couple, a new set of parents that are still adjusting to a new baby, or a family that has been struggling with illness or a death. If you wish to gift someone you love with a cleaning service, call 206-258-7500. What Are PureClean’s Competitive Advantages? These are some of the main advantages that Pure Clean offers over the traditional carpet cleaning companies in Seattle. Instead of using conventional soaps and detergents, we use UltraPure water that actually cleans and sanitizes your carpet, lifting all the dirt, grime, oils, stains, odors, and bacteria from your carpet. The best part? We use all natural cleaning products that are 100% family and pet safe. The products actually produce longer and better results than our competitors. We always offer a full service — we move and, when possible, replace your furniture for you. Spot removal is included at no extra charge. We always wear shoe covers and use corner guards, furniture pads, and styrofoam blocks to make sure that your walls and furniture are protected during the entire process. We offer a wide variety of in-home services to meet your cleaning needs, including carpets, upholstery, mattresses, hard surfaces, vehicles, specialty cleaning, and oriental rugs. We even have an exclusive edge cleaning tool that is guaranteed to remove or significantly reduce the black filtration lines that most homes have around the edges of their carpeted rooms. At Pure Clean, we are family owned and operated – not a franchise. This means you will always deal with the Surdi’s and be treated like part of our family! As you can see, we’ve got a lot up on our competitors. PureGuard is a carpet & upholstery fabric protector that helps your carpets & upholstery stay clean, bright, and fresh while reducing the effects of wear and tear. PureGuard contains an acid dye blocker that is specially formulated to repel acid-based stains — the most common type of household spill — giving you the extra time you need to get it cleaned up! The powerful, invisible shield of PureGuard protects carpet fibers from getting dirt and allergens lodged within the fibers. This protects carpets from dirt and dust build-up, and allows for a more thorough vacuuming, thus creating a cleaner and healthier in-home environment. Carpet manufacturers recommend the application of PureGuard after every professional cleaning as it replaces the protectant that originally comes on your carpet, but which is worn down over time. PureGuard is completely safe for in-home applications. An investment in great cleaning deserves to protected!